"I'll leave it up to you" (from Japanese "to entrust" (任せる makaseru)). Omakase – A type of meal consisting of dishes selected by the chef. Or rather, the chef serves daily fresh ingredient available to the guest. 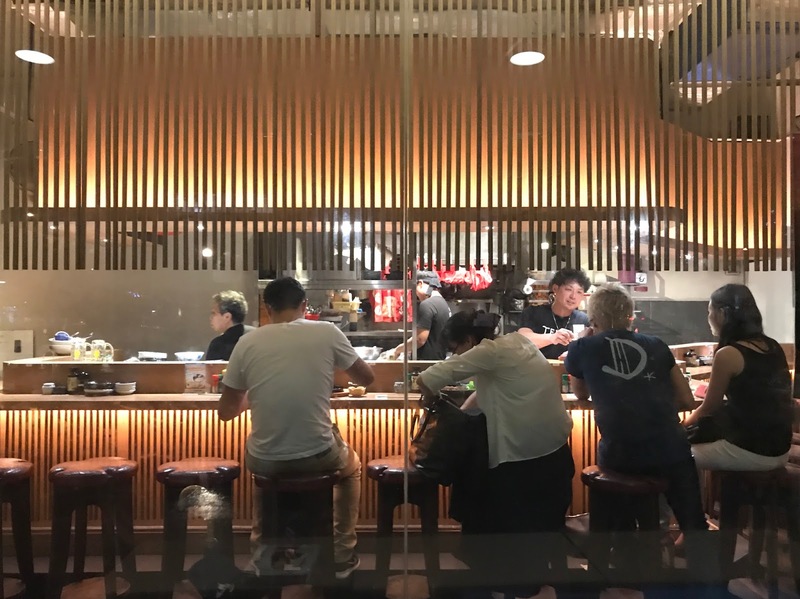 Other than savouring the food, what makes Omakase meal expensive is the meal experience. There are more interactions with the chef and you get to see various chef flaunting their culinary skill. Honestly, how do they get the perfect cut everytime? Nonetheless, Omakase is not for everyone. Especially if you have a diet restriction, the chef may not be able to accommodate to all your request. You might end up paying sky high price for a bowl of fried rice. Last week, I had the opportunity to visit Teppei for my first Omakase experience. I was so excited because H managed to secure the booking just a week before. I am not too sure if it was because we are lucky or it was on a Monday night? First up, we were served with a plate of appetizer. From top left to right – Fishcake, Tofu and beancurd skin. Fishcake was cold, the Tofu I got was uncooked and the beancurd skin was salty. From bottom left to right – Salmon, Radish and Squid. The salmon was good as the combination with a slice of lime and fish roe made the salmon more ‘interesting’. The radish in a cup of lemon was very refreshing. The squid is pretty good too! 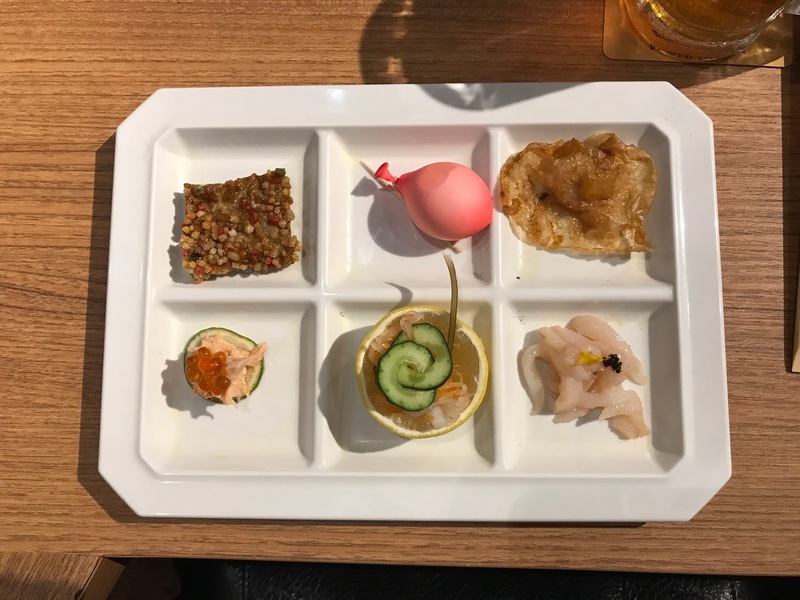 Honestly speaking , I was disappointed with the plate of appetizer. I thought Omakase is all about serving you the best and most creative dish of the day? Creative ? - Yes, Tofu in a balloon is creative. But uncooked Tofu in a balloon is not acceptable. Cold fishcake? How about putting a piece of ice to make it colder. Just kidding. You get what I mean. Thankfully the sashimi saved the day. The first slice I had was Tuna Belly. It is thick, fresh and juicy! You can taste the freshness as it melt in your mouth. Fatty salmon did not disappoint either. I wish I could name the other sashimi but the chef were all too busy. So no introduction was given. Next, Chawamushi was serve in a egg shell on top of salt. Creativity – checked. To top it off, there were bits and pieces of shark fin added into Atas Chawamushi . The Chawamushi has a perfect silky texture with a lighter taste as compared to the ones I had before. If you find your Chawamushi too light, you can add more salt. Then, I was served with a tuna roll. The roll was filled with generous serving of chopped tuna, fish roe, sushi rice and fried tempura. It is so good and I don’t mind having more. Not sure why but H got a bigger slice & I can’t stop staring at the tuna as he eats it. Japanese fresh oyster with light soy sauce and chopped spring onion. The oyster was plump, fresh and juicy. Mackerel was marinated with soy sauce and plum. Not sure if the fish was supposed to be salty. It had a similar taste to the canned sardine we had at home. Just as the dish is going down, a spoonful of uni came to the rescue. Ahhhh, literally melt in the mouth with a little ‘pissy’ and sweet taste. A japanese quail egg, a piece of green japanese ginkgo, yam and a piece of cuttlefish with cheese. I think I am supposed to be impressed by the piece of green ginko. Unfortunately, I’m not a fan of ginkgo, so the color did not matters to me. The yam was somehow rolled into smaller piece of yam and coated with salt. The thin slice of cuttlefish with cheese had a unique combination – crispy and cheesy. Afterward, a small slice of fish was served with radish and Shimeji mushroom. The fish is hard and was slightly over cook. However the radish in the soup is really good – Soft and juicy. Then, We were serve a medium size scallop which was fresh. As I don’t take beef, they gave me this grilled pork. The grilled teriyaki pork was not overly cook – Tender and juicy. H was served with 2 slice of Wagyu Beef. Not sure how it taste but H was still raving about it the next day. Not a fan of noodle but this Shou Mian took me over by surprise. Especially the noodle. It is tangy and goes really well with the broth. Afterwards, a bite-size of pear was served. Finally, after 14 dishes we had our mains served. I choose 4 kind sushi while H choose Unagi Chazuke. There are other options such as Wagyu Beef fried rice, Uni Fried rice and Sashimi rice Don. We were very pleased with our option. The sushi was prepared by the boss himself and sure enough the sushi did not disappoint. Shiny, translucent sashimi top with rice, definitely one of the better sushi i ever had. H’s Unagi Chazuke tasted pretty good too. Tip: If it happens to be a birthday celebration, inform the Teppei in advance and they will prepare a special sashimi cake for you as the mains. Ice cream was served as dessert. I was kind of happy when everything finally end because it was almost 11pm (Bed time!) Thankfully, the chef kept us entertained while we were halfway through the course. If not, i will doze off. Overall, I find that I like the sashimi more than the mains served. There are hit and misses along the way. I guess this is all part of Omakase. After my first Omakase experience with H, I tried looking for a second omakase experience but they all cost between $300 - $450 per person. No wonder Teppei is well known for its value-for-money Omakase in Singapore. Make your reservation here. Do check out the facebook page here for updates.